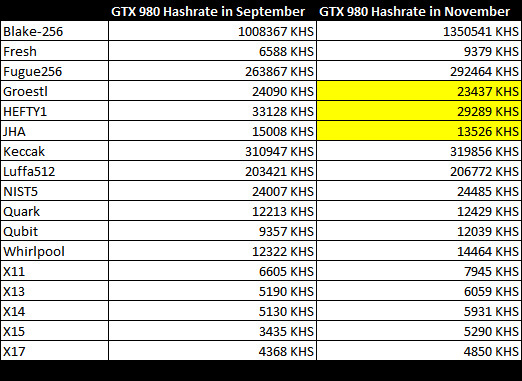 Back in September with the release of the new Maxwell-based NVidia GPUs, the GTX 970 and GTX 980 we did some performance testing of the GeForce GTX 980 hashrate using the available at that time ccMiner and CudaMiner miners. Today, a bit over two months later we’ve decided to check how hings have progressed in terms of performance improvements of the various crypto mining algorithms with the latest optimizations available in ccMiner. We’ve used the just posted Maxwell-optimized ccMiner 1.5-git ccMiner fork from SP to get the performance results from the same GTX 980 GPU running at stock frequencies (overclocking can further increase performance).